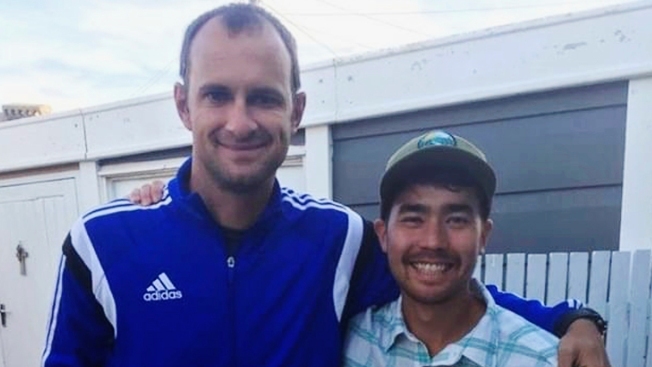 "John lived and gave his life to share the love of Jesus with everyone"
In this October 2018 photo, American adventurer John Allen Chau, right, stands for a photograph with Founder of Ubuntu Football Academy Casey Prince, 39, in Cape Town, South Africa, days before he left for in a remote Indian island of North Sentinel Island, where he was killed. Chau, who kayaked to the remote island populated by a tribe known for shooting at outsiders with bows and arrows, has been killed, police said Wednesday, Nov. 21. Officials said they were working with anthropologists to recover the body. John Allen Chau spent summers alone in a California cabin as a wilderness emergency responder, led backpacking expeditions in the Northwest's Cascade Mountains, almost lost his leg to a rattlesnake bite, and coached soccer for poor children in Iraq and South Africa.